From 7-20 September, students at the European School of High-Energy Physics brought their enthusiasm for physics to Cheile Gradistei, Romania. This was the school’s first time in Romania, which is set to become a CERN Member State in 2015. Students from the 2011 CERN School of High-Energy Physics. Students attended a comprehensive programme of lectures and discussion sessions, and were also given the opportunity to discuss their work with their teachers and peers during a student poster session. “We also asked the students in each discussion group to work to dissect both the theoretical and the experimental aspects of a single LHC paper,” says Ellis. “These discussion group projects were enormously successful during our Latin American School earlier this year, and were just as popular in Romania!” For the final day of classes, CERN Director-General, Rolf Heuer travelled to remote Cheile Gradistei to speak to the CERN School students and teachers. “Rolf gave a lecture to the students about CERN’s scientific programme. It was a great opportunity for students to interact with Rolf personally,” says Ellis. 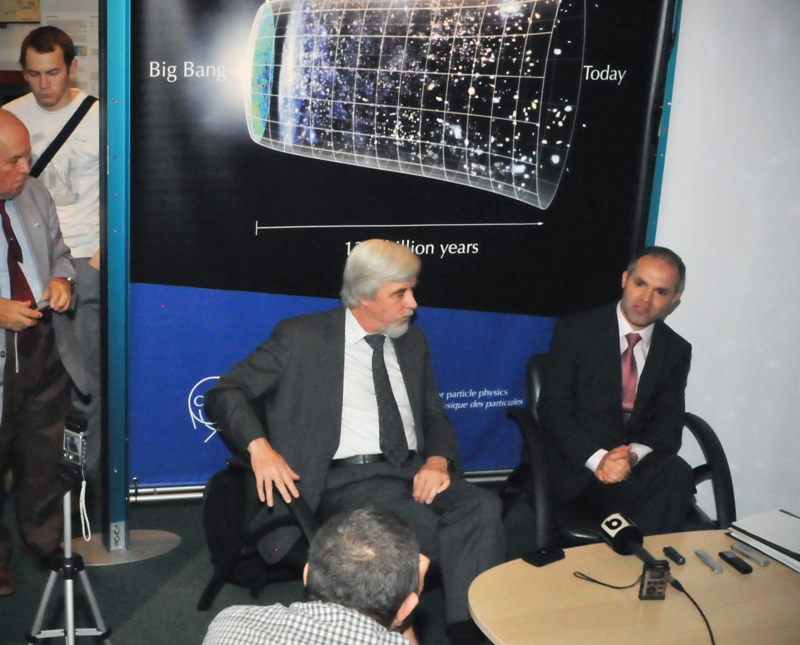 Director General Rolf Heuer and Minister Daniel Petru Funeriu gave a joint press conference at the CERN exhibit. With Romania set to become a member state of the Organization, links between the two are growing closer. In parallel with the School, an exhibition about CERN for the general public opened at the Central University Library Carol I in downtown Bucharest. The Romanian organizers arranged for the CERN School participants to stay in Romania for an extra day, giving them the chance to visit the Romanian capital and the exhibition. In addition, the students were able to attend Rolf Heuer's public lecture at the University of Bucharest on 20 September where he was introduced by Daniel Petru Funeriu, Romania’s Minister for Education, Research, Youth and Sports. During a joint press conference with the DG, the Minister described Romania’s membership in the Organization as the “top priority” for his office. Over the next five years, Romania will ramp up their contributions to the Organization towards that of a normal Member State. In 2015, CERN Council will decide on Romania's application for full membership.